Oceans cover more than 70 percent of the earth’s surface and store as much as 97 percent of all water on the planet. Their rich, complex and biodiverse environments provide crucial ecosystem services that are key to all human and nonhuman life on earth. Especially in the context of developing countries, oceans and marine resources greatly contribute to poverty alleviation and food security to both coastal and inland communities. But despite the importance of oceans, human activities pose many threats to the sustainability of marine environments, which are especially vulnerable to pollution, overfishing, and degradation of habitats. Sustainable Development Goal (SDG) 14 is dedicated to life under water and aims to “conserve and sustainably use the oceans, seas and marine resources for sustainable development”. Worldwide, both at the local and the global level, researchers, policy-makers, and other stakeholders all are making efforts to reach this goal. The collaborative program on the Sustainable Management of Marine Resources is one of these initiatives. EfD through this collaborative research program aims to provide reliable inputs of knowledge-based advice to national policy processes in the Global South relevant to reaching SDG14. Our strategy leads to local appropriation of environmental problems by well-trained scholars who have strong roots with the countries where the EfD centers are based. This puts EfD in the ideal position combining our expertise in environmental economics with in-depth knowledge of the relevant sectors to SDG 14 in their local context and to identify locally relevant research questions and policy solutions. 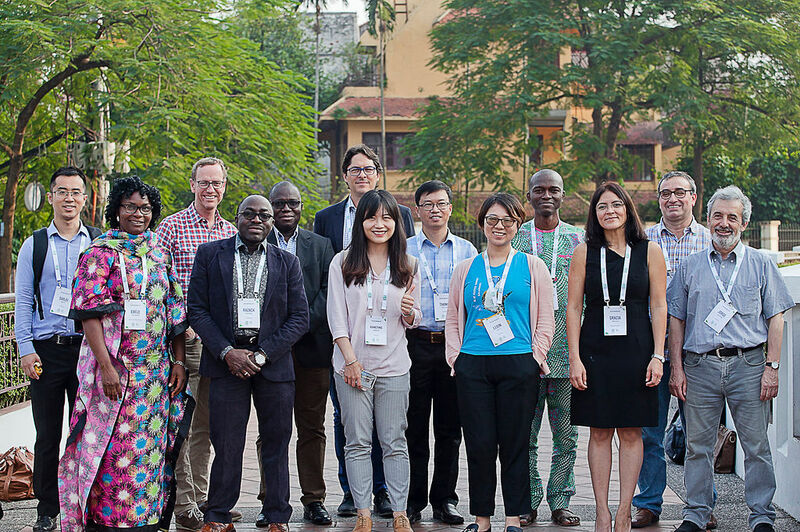 The program involves researchers from 10 different countries - Chile, China, Colombia, Costa Rica, Ghana, India, Nigeria, South Africa, Tanzania, and Vietnam. Economic Benefits for Developing Countries through Sustainable Aquaculture. Marine litter is both a transboundary global problem as well as a local issue, for which changes in consumption behavior are urgently needed. Although representing only a small share of total solid waste discharges, the increasing presence of plastic particles in oceans cause multiple threats to sustainability. Besides being detrimental to coastal ecosystems and damaging for marine life, toxic substances in plastics can also cause severe harm to human health. Marine plastic pollution is a global public bad. Each person that throws plastic in nature is causing minimal harm on themselves, while the total impact on society can be large, including negative effects on ecosystems. In order to reduce this global public bad, we need to change the behavior of people. Altering community behavior via training and information is one way that has proven to be successful. However, for plastics there is a lack of knowledge of how to influence norms and human behavior, which is a necessary element in tackling plastic pollution, particularly in countries with poor institutions. At the core of reducing plastic waste is the need for a change in social norms at a global level, which is an enormous challenge. This program aims to tackle this challenge by learning from previous experience on the importance of information, social leadership, and other factors on influencing those social norms. Overfishing and depleted fish stocks is the result of open access (tragedy of the commons) conditions where an individual fisher is acting in line with what is best for her personally. However, the joint outcome of all fishers’ actions is that not only do the ecological conditions of the fishery deteriorate, but also do the economic returns. From social sciences we know that in order for fisheries to be sustainable, it has to be well defined who is entitled to fish and who does not have access to a fishery. Although catch shares where access and rights are better defined are gradually spreading around the globe, most developing countries are still fighting with traditional problems managing their fisheries. Fisheries management in developing countries often struggle without access to biological data, and in addition, there is a lack of standardized data collection in economic and social terms as well. The result is that it is barely possible to evaluate various policy changes and even harder to identify crucial traits that poorly managed fisheries have in common. This program will therefore make an effort in contributing to data collection in a standardized way that also is applicable to data scarce fisheries. Over the last 30 years, we have seen a tremendous growth of aquaculture production, while output of capture fisheries has been constant. Aquaculture contributes both to economic growth and food security. Many poor farmers are reducing the area of rice fields, in favor of fishponds with higher profits, which results in cheaper fish instead of rice to the local market. The individual farmer may cause negative externalities to the environment like nutrients contributing to eutrophication or overuse of antibiotics to cure fish from diseases. The joint growth of aquaculture, particularly in poor countries with weak institutions, also poses a coordination problem to planners and policy makers. Too strict regulations will halt the economic growth, while too lax regulation may lead to epidemic diseases or hypoxia causing ecological and economic collapses. The primary objective for many developing countries is to strike a balance in order to promote blue growth in a sustainable manner where success serve the two-fold purpose of increasing supply for the domestic market as well as export income. Because there is currently a lack of standardized data on aquaculture, an important contribution will be data collection to facilitate the identification of indicators in order to disentangle the relationship between factors of economic progress and factors causing various forms of environmental problems in the aquaculture sector.